At Tacos del Pacicico Pigmon told me about a recent lunch at Romano's Pizza in Des Plaines, though he was not overly enthused. He mentioned too thin, too crisp, mediocre ingredients and, once again, too thin and crisp. Frankly, it was all over for me as soon as he said "too thin and crisp" No such thing as too thin and crisp! Let me be clear, Romano's is time warp pizza, slightly greasy, canned mushrooms, jar garlic, pizza purists need not read further. For me it's all about the crisp, and Romano's is crisp, thin and, even given obvious flaws, pretty good. The sausage, small fennel laden chunks, was tasty, though a bit scarce, and the nicely balanced tomato sauce complimented the pie. Once again, not for the pizza purist. Our appetizer of Clams Dominic was a study in excess, laden with diced garlic (jarred) minced onion a herb or two and enough olive oil to float at gondola down a Venice canal, hit the spot, in the same way movie theater popcorn with ersatz butter can be satisfying. Fried zucchini, which come prebreaded frozen, were less successful and the garlic laden sour cream was 'interesting'. 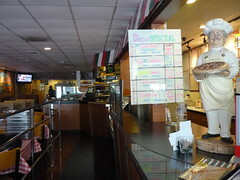 Romano's Pizza is the archetype Italian/American pizza joint. Volare on the stereo, row of Italian celebrities on the wall, including an augographed in 1976 picture of Frank S, comfy, well-used bar area smelling (more than) faintly of cigarette smoke and a couple of fair sized dining room, replete with murals of Venice Italy. Service is very good, in a casual, friendly, though professional fashion and I'd dare a guess the two waitress on duty tonight had 30-years of combined service, at minimum, serving Romano's customers. Just so there is no misunderstanding, I liked Romano's pizza, but I am a thin crust/crisp pizza kind of guy and can overlook much when I hear that crunch. As for purist, F-them! (Meaning forget them). There are people that get all nuts and hoity-toity about pie, but as long as it tastes good, who cares? What you described sounds very good. I love thin and crispy . . . as well as thick and crispy . . . and thin and foldable. I might have to check this out as it's not too far from my office. But anyway, how could I possibly criticize what somebody else likes in pizza -- I still enjoy Barnaby's pizzas, even with its bland toppings. I just love that strange crust and I'm willing to admit it. Met a couple of friends at Romano's last evening and, if anything, liked it even better than my first visit. As we were placing our two thin crust pizza order our waitress, Michele, suggested we switch one to her favorite a "Panless Pizza." Panless Pizza which doesn't mean no-pan, but, for reasons unknown, crushed tomato instead of tomato sauce and less cheese, was very good, rivaling Candlelite, but not Vito and Nick's on Pulaski or Zaffiro's in Milwaukee. The roughly crushed tomato lent a freshness to the pizza accented by the light hand with the cheese. The bar is convivial, dining room comfortable, waitress friendly, and pizza, especially panless, thin, crisp and much to my taste. I'll be back sooner rather than later. You can't be a purist all the time. Sometimes you just want junk food. I think that applies to a lot of things, not only pizza. viaChgo wrote: You can't be a purist all the time. Sometimes you just want junk food. I think that applies to a lot of things, not only pizza. Actually, I think the pizza at Romano's does appeal to the Chicago Thin Crust purist. It is quite good, not greasy and far from junk food. See, funny you should ask pizza purists to skip this thread, as the pizza in the picture looks more to me what a real pizza should look like than most of the pies sold here in Chicago. Now, don't get me wrong, I like all kinds of pizza, but thin and crisp is the best! I'll have to check this place out. Let’s be frank: I struggle with Chicago pizza and, trust me, no one in this town wants to like its pizza more than I. But as a life long Chicagoan, this never-ending pursuit is like trying to find the Holy Grail. At this point, I can’t take these continuous disappointments anymore. My only solution is to periodically try some highly touted pizzerias and hope for the best. This week, I tried 2 such Chicago pizzerias; Candlelite and Romano’s. Let’s start off with the goods news about Candlelite; the sausage is decent if not good. Nice tasty chunks with an appealing amount of fennel. Moreover, the pizza was cooked about as perfectly as one could expect. Whenever a pizzeria can successfully make a crispy, wafer-thin crust and top it with disproportionate amounts of ingredients (regardless of their quality), I’m impressed with their technical pizza making abilities. However, I feel strongly that good pizza, at a minimum, must be some sort of respectable attempt at making good bread or in these 2 cases, a good cracker. The potential debate about this point concerning pizzerias like Candlelite and Romano’s and their cracker-thin crust has more to do with how important the flavor of a good cracker matters to a pizza or not. I like a bland water cracker as much as the next guy but usually it is acting as an organic plate for carrying morsels of goodness, like a wonderful pate or some sort of stinky cheese. The key point, though, is that the crust supports something of serious quality. Otherwise, if it has no redeeming characteristics, what’s its value? The cracker crust at Candlelite should be looked at in the same light. Its absolute and utter lack of flavor apparently is not an important concern to the integrity of the pizza for either its creator or their fans. I didn’t run across any problems with an undercooked crust since we ordered it well done, as some others have complained. As far as their other topping ingredients, I was disappointed to say the least. The cheese was rubbery and flavorless. It never helps to use ridiculous amounts of low grade cheese. Hence, the indigestion after dinner. The sauce was overly sweet and thick, (much like Ragu Spaghetti sauce). Flavorless crust topped with poor ingredients won’t ever make a good pizza, in any form or style, coming from any region, no matter how sensational their execution might be. Candlelite falls into this category. I want to thank the people at Romano’s for reinvigorating my passion for the pursuit of great Chicago pizza. I take pride in the fact that their cheese ball décor and music, (which obviously hasn’t been changed in years) didn’t prejudice my love for their pizza in any way. Like Candlelite, Romano’s also has a cracker-thin crust. The difference being that I could greatly enjoy eating their cracker crust on its own. 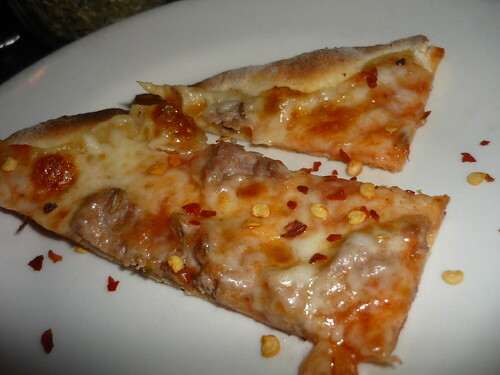 Its flavor and texture is sensational for this type of pizza. But what I most enjoyed about Romano’s is their ability to moderate the amount of toppings. I often times feel nauseous after about 4-5 small pieces of pie, which was not the case, having eaten a lot more pizza than that here. I’m not quite sure if they are using better ingredients than your average pizzeria in Chicago but I do know that its ratio of crust to toppings sets it apart from every other pizzeria that I've have tried here so far. The sauce had a nice vibrancy to it, not being overly sweet. 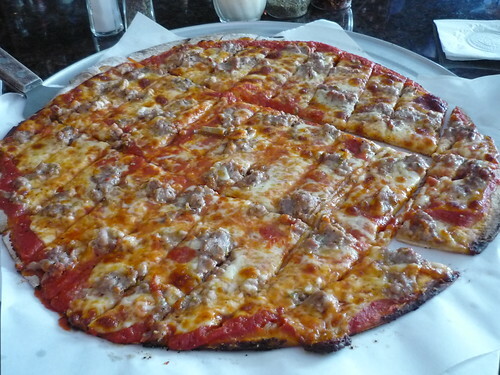 If you like cracker thin pizza, Romano’s is worth the trek out to Des Plaines. I meant the "Pizza Purists need not read" as tongue in cheek. I forget that, often, humor does not translate well in all text mediums. Romano's 'panless pizza' was really good the other night and I recommend it to any and all who enjoy crisp thin crust pizza. G Wiv wrote: As we were placing our two thin crust pizza order our waitress, Michele, suggested we switch one to her favorite a "Panless Pizza." I take it that there is some awareness on the part of the folks at Romano's that this approach is a more traditional one and they therefore also use less cheese in combination therewith, rendering the pie more Italianate in character and less 'Merican'. 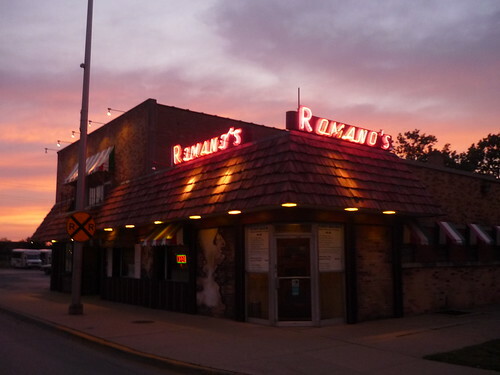 If I find myself some day in Des Plaines and in need of a meal, I'll definitely try to visit Romano's and check it out. Thanks for clearing that up, Antonius. How often have you seen this style here in Chicago with a thin crust pizza? Of course, its common for deep dish but I can't recall off the top of my head ever seeing it for a thin version. When I first saw the crushed tomato chunks at Romano’s, I was a bit cynical. However, I became an immediate believer after the first bite. It especially didn’t hurt that they use only moderate amounts of cheese. 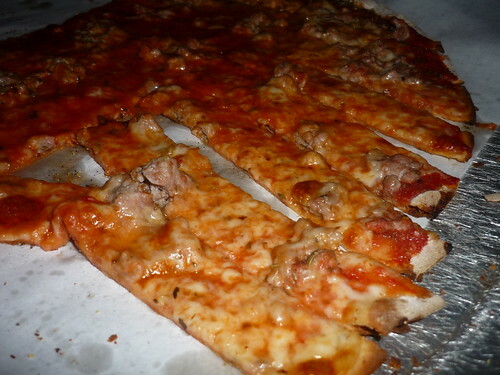 PIGMON wrote: How often have you seen this style here in Chicago with a thin crust pizza? That was s first for me. I don't think even Lou Malnati's thin crust is made this way...and certainly its not nearly as thin and crisp. Ok, this tears it, I have to get back into making pizza at home, seeing that picture, and looking at past pizza threads is more than I can manage. I have a really nice, maybe 2-inch thick, pizza/bread stone in the basement (somewhere) I just hope it's not too hard to find. i'm new to this board and i can't believe i haven't found my way here before now. glad i found you all! i'm a fellow thin-and-crispy cracker-thin pizza fiend as well. it's a hard thing to be in chicago. don't get me wrong--i also like chicago style and stuffed pizza, but my absolute favorite is cracker-thin. for me, the all time best is barnaby's on caldwell in niles. as someone mentioned upthread, it's that crust. always very thin, very crispy, lots of cornmeal on the bottom, and somehow it has a buttery flavor. keep in mind, all the various barnaby's are independently owned, so they vary from place-to-place. the one in niles just re-did their kitchen last summer and added a brand new foulds oven. i was a bit worried when i saw the new oven, as sometimes that will screw things up....but their pizzas are coming out as good as ever. i've also enjoyed pat's pizza on sheffield and d'agostino's on southport for cracker-thin pizzas. the key, of course, is not to overload the toppings and sog out the crust. it's amazing how few places understand that. oh, and i used to work at the carlucci in rosemont and while the food there is generally pretty mediocre, they do make above-average pizzas in their gas-fired pizza oven. they're not on the dinner menu, but can be had on request. but they're better at lunch when javier the pizza guy is working. again, great board, great thread. i'll be posting and reading here regularly! elakin wrote: oh, and i used to work at the carlucci in rosemont and while the food there is generally pretty mediocre, they do make above-average pizzas in their gas-fired pizza oven. they're not on the dinner menu, but can be had on request. but they're better at lunch when javier the pizza guy is working. This is the kind of detail I love learning, which comes by sharing experience. I do believe elakin, you fit right in. Made my first trip to Romano's tonight and was impressed. Now this is the kind of place that makes the Des Plaines area great! Old School Italian joint with very friendly service and a nice crowd of old timers. In particular, I like the bar area. I enjoyed a panless sausage & mushroom pizza (medium). As many have mentioned, the crust is super-thin but super-crispy too. Most impressive was the complete lack of any grease, particularly in those middle pieces that tend to get sogged down with grease at other places. 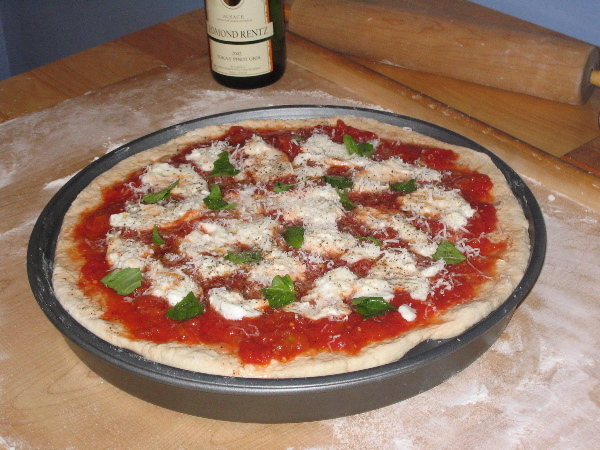 The "panless" pizza refers to the type of tomato sauce used - crushed tomatoes instead of more of a paste. What I liked about this style was the tanginess and just a right amount of sweetness to it that made the pizza work. One shortcoming that I found with the pizza, which another poster notes as a strength, is the smaller chunks of sausage on the pizza instead of healthier sizes. I'm a fan of big chuncks of sausage, and at times, I felt that that the sausage on my pizza was lost among the chunks of tomato. But this was an excellent pizza from the type of place you'd be proud to bring pizza fans to. My all-time favorite "super-thin" crust pizza is from Pat's in Chicago and I'd still have to rank it higher than Romano's but in some ways, it's an unfair comparison because the type of pizza I got at Romano's made it an apples-to-oranges competition. I will do some more thorough work in coming weeks to do a true comparison. One question: the person who recommended Romano's to me said to stay far, far away from their deep dish. I find it hard to believe they would do a terrible deep dish when they do such a good thin, but is this true? I'm usually not a fan of deep dish anyway. I've had a craving for a thin, crisp, crackly crust pizza fueled by the posting of an LTH lunch this week at Marie's I couldn't make. Decided the next best thing was a visit here last night. Other than the absence of smoke in the bar, everything remains in a time warp worthy of the finest backwoods supper club. Most important, the pizza continues in the warp, not having changed one bit, even the sausage still being a bit scarce. The crust was as thin and crisp and crackly as I think could be had from dough not preserved in a box. 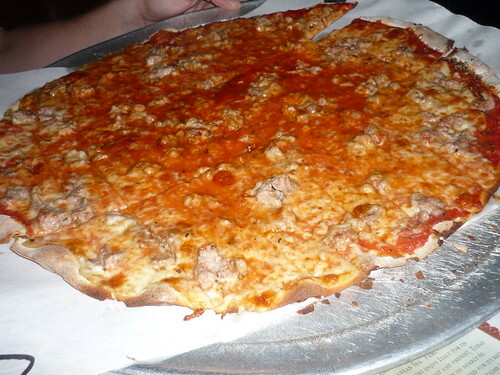 If your a fan of this type of pizza, Romano's, continues as a place to seek it out. I also live by these words when it comes to my pizza having grown up on Pat's pizza (Original location on Sheffield). I'm willing to travel when I hear a place serves up this form of "Chicago-style", so last night I drove up from Lincoln Park with a buddy to try this place. Soon as I walked in I knew that the restaurant had been here for some time. We walked into the bar section, which I imagine was the original location while the dining room was an expansion at some point. The waitress, who was very nice informed us they have been using the same recipe for 56 years or something like that and the pizza would "not disappoint". I'm happy to say it did not disappoint one bit, it was thin and crispy, just how I like it, and the sausage was real Chicago style sausage. I still think Zaffiro's (Milwaukee, WI) is the best pizza Ive ever had. Romano's may be just a step below Vito & Nick's but its still really good. I imagine there were alot more pizza places like this spot around Chicagoland back in the day (I'm only 26) and I am glad I found it. The amazing sausage pizza race* had me wanting sausage pizza last night. I had to pick up my buddy from O'Hare who also happens to be a Cardinals fan so he wanted to stop somewhere to eat and watch the game. Romano's it was for some tavern pie, a beer and to catch the start of what would hopefully be a Cardinals loss. I've learned you have to request your pie extra crispy or it will be soggy in the middle. I also really get a kick out of the unique way of slicing they use. Its amazing how many people come in and out for pickups of the pizza that they know on a name to name basis. Its a real neighborhood type joint over there. As far as atmosphere, its the best of the tavern styles I've come across. Some real characters at that bar. It turns out they are all from my neighborhood, oh rather I'm from there's. *My money has been on the dude since day one and I am very happy with the Johnny Knox like sprint out of the gate and have faith that he is also trained for a marathon. I finally stopped in for lunch not too long ago when I had some business to take care of out that way. Well as you can see from the first photo from where they used to be housed and then where they're at now the atmosphere from an old school Midwest pizza parlor is gone. They still got Italian murals on the walls, red and white squared table cloths and all the old photos of celebs from another era. 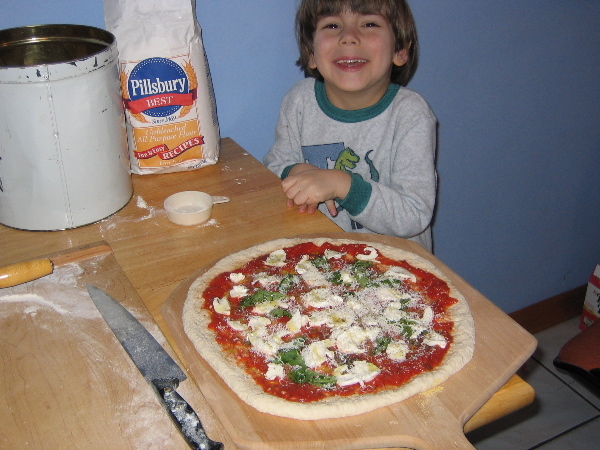 The pizza which is still sliced the same way looks a little different as far as the then and now pictures go tasted similar to what I remember it being. Except I recall the crust being better then. Still respectable tavern style thin pie with good sausage. A nice option to have if in Rosemont and they do deliver. They also serve gelato and have a deli station with different cold pastas and tuna salads on sale to take to go as well as single slices too. 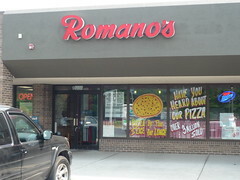 I have to give Da Beef the credit (on his smokin chokin blog site) for turning me onto the new Romano's in Rosemont. I'm not real familiar with the finer culinary treats of DP or Rosemont, but this was well worth the trip. I grew up on Q's in Hillside, Armand's in Elmwood Park, and Villanova in Stickney, but this was excellent thin crust pizza. Very thin crust, with nice crispy edges. The tomato sauce was the perfect blend of zest, garlic, and sweetness all in one. And the sausage is made in house, and was truly excellent. The server, Gerri, may have came over from the old DP location, but I'm not sure. She was very family friendly, and she seemed to know everybody in the place on a first name basis. She treated us like she had known us for 20 years. Very good service, and very good food all the way around. Nice neighborhood place. And their cheesecake dessert was very tasty, too. Hopefully, they will live a very long life at their new location. If I may offer one suggestion with respect to the Rosemont Romano's: Do not order the pizza by the slice, no matter how tempting and no matter what daily special is offered! It is of vastly different quality (i.e., poorer) than the freshly baked pizzas, which are prepared quickly, and available in small sizes. But as for the whole pizzas, they are quite good in my opinion. Thanks to everyone for the great pictures of Romano's pizza. I should have brought a camara on my visit, so shame on me. 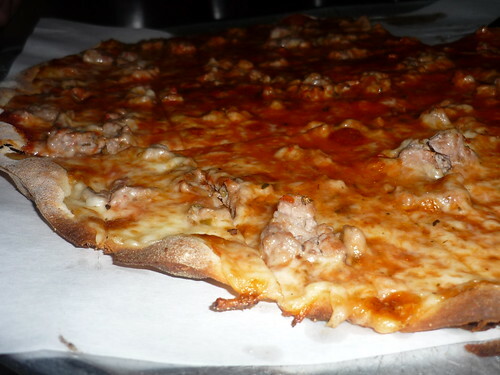 From now on, Romano's will definitely be in the pizza rotation once a month for thin crust with sausage.